FinFolio converts all your data from Advent Axys®, Moxy® and APX®. Get up and running quickly on FinFolio with the same data you have been using for the last 20+ years. Don't worry. We are really good at this. It isn't easy giving up a system that has served you well for many years. Moving from desktop software to a new, modern web product can be intimidating. You know you need a modern client portal and better looking reports to keep your clients. Plus it would be nice to have integrated billing and rebalancing, and a report writer simple enough that you don't need consultants. Ready to make the leap? We've got you covered. Our team is the best in the industry at converting from Advent products. Our seamless process moves all your data including transactions, performance, groups, performance and prices. Your INF files are used to build FinFolio's security master and splits become split transactions, clearly visible in every account. 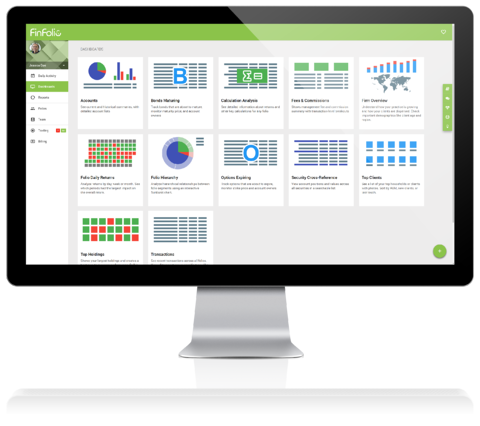 FinFolio emulates Advent's flat file architecture better than any other system. All of the same familiar elements are still here, presented in a modern web app with powerful but simple tools. Contact your custodians so FinFolio can begin recieving your data. Upload your most recent Advent CLI, PRI, INF, PRF and GRP files. We can help you with this if you don't know how to extract them. Run FinFolio in parallel with Axys®, Moxy® or APX® until you are comfortable. * Extremely large databases may take longer than a week.